While our capability in prediction large-scale flow structure for the medium range has experienced marked advances in the last few decades, the short-term forecast (less than one day) of high impact weather at the county/city scale lags seriously behind. The Short Term Explicit Prediction (STEP) program was established in 2005 to tackle the challenging problem of accurate (location and timing specific) prediction of hazardous weather via an collaborative effort across several NCAR labs. 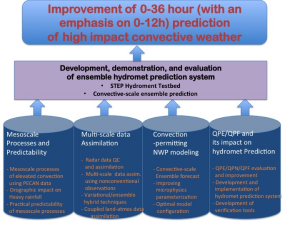 In the recent few years, the main focus of STEP is to improve heavy precipitation and flash flood prediction by developing an integrated hydro-meteorological system that is able to produce quantitative streamflow forecast with improved rainfall estimate and nowcast/forecasting. 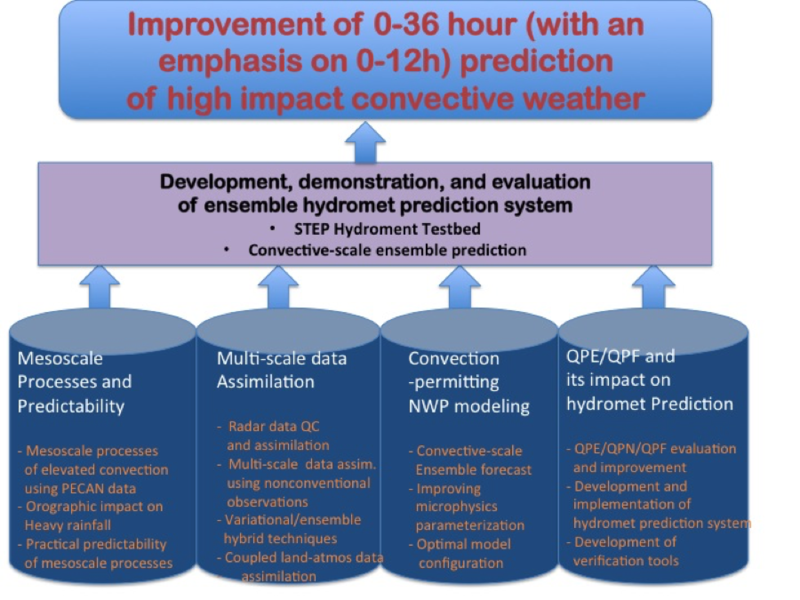 That objective is being supported by four research topics: mesoscale processes and predictability, multi-scale data assimilation, convection-permitting NWP modeling, and QPE/QPF and their its impact on hydromet prediction, as well as a cross-topic theme that features real-time demonstration and evaluation of STEP modeling systems. STEP currently funds seven projects in support of these research areas with participants from three research Labs: RAL, MMM, and EOL. High-resolution, short-term forecasts of high-impact weather provide critical information for a wide range of users, including the aviation community, ground transportation, urban emergency and water resources management groups, recreation facilities, construction industries, and the military, that assists them to safely and efficiently deploy resources. However, achieving reliable and accurate convective weather forecasts remains a scientific challenge due to uncertainty in grasping initial conditions, shortcomings in model physics and computational capabilities, and limitations of our understanding of how nature works. The forecast skill of observation-driven expert systems decreases rapidly with increasing lead-time, while numerical weather prediction models exhibit a limited forecast ability within the first few hours after initialization primarily due to spin-up problems. For explicit flash flood forecast, the coupled hydro-meteorological model requires accurate precipitation forecast that is beyond the capability of the current operational models can provide. STEP’s mission is to address the challenge of short-term high impact weather prediction through an broad end-to-end approach and a broad across-NCAR collaborative effort.